If you’re a breastfeeding mama who pumps and has also stressed about the amount of milk you’re providing for your wee one(s), then this post will be a welcomed hail Mary. I can’t tell you how many nights I Googled “how to increase milk supply.” There’s so much pressure as a working mom to make sure my kid has enough ounces to make it through the day. I’ve drank the teas, swallowed the pills and tried two different lactation cookies, but I was barely making the minimum and I was stressing — which we know is oh-so-helpful for your supply. Luckily, I caught a blurb Tamara Mowry posted on Instagram about being a working mother and how she pumps. She recently had her second child and posted a pic of a bar next to a full bottle of pumped milk. If you want to get a milk-obsessed mom to pay attention to a post, throw up a pic of a mountain of milk. My mouth fell open. I immediately clicked on the lactation bar’s page and ordered the bars without hesitation. I’ll cut to the chase: Mrs. Patel’s products work. I placed my order and a week or so later I received the bars in the mail. I froze them for 30 minutes like the company suggested and the next morning I ate my first bar. It’s one bar per day. Easy, right? They taste pretty damn good too so adding them to your morning routine won’t be a chore by any means. The results? I pumped nine ounces my first pump session. (It’s a good time to note that before I was getting three ounces in a 30-minute sitting.) I seriously almost cried. The next two days I pumped the same awesome amounts. My first pumps provided a ton of milk. The second session I’d get five or six. Then I got sick … And my supply dropped quicker than a new Adele track, but I kept eating the bars and drinking fluids like a mad woman. It took longer than I’d care to admit to get better, but once I kicked the cold, my supply went back up. I was skeptical that maybe the large pumps had been a fluke, but this week I’ve noticed crazy amounts again. Usually my supply is teeny tiny come night time, but I pumped nine ounces at 8:30 p.m.! I don’t know about you, but I used to be lucky to get two ounces after 6 p.m.
Why they work is a complete mystery. I know they contain fenugreek, but fenugreek alone has never really worked for me. Whatever spices they throw into the mix that promotes Ayurveda (an ancient medicinal system) works. I’m a fan for life. I plan to give these bars to new mamas who plan to nurse. I know what you’re thinking … “Well, you’re just one review, honey.” Which is why I told a couple of mom friends to try. I have one bud who has always struggled to produce enough milk for her baby. I recommended she order them. I could tell she was disheartened by all of the other attempts she tried, but she agreed to give it a go. She texted three weeks after finishing her first box of bars to tell me the good news. Unlike me, she breastfeeds exclusively so you’d think it would be harder to gauge if her supply went up, but she said her little one nurses for longer periods of time and for the first time since she was born is plumping up. (The plump test is THE best proof that the dang things work!) I have two other moms who are waiting for their shipments, but I’m pretty confident they’ll work. I’m looking forward to hearing from them. Breastfeeding has so many awesome benefits, but it can be so unbelievably hard for so many reasons. I’m a firm believer that we moms need to stick together, so when I try a product and it makes my life easier I feel compelled to share the wealth. Full disclosure: This company didn’t pay me to gush about its bars. They have no idea who I am, but I swear if I saw Mrs. Patel in the street I’d give her a big fat kiss. 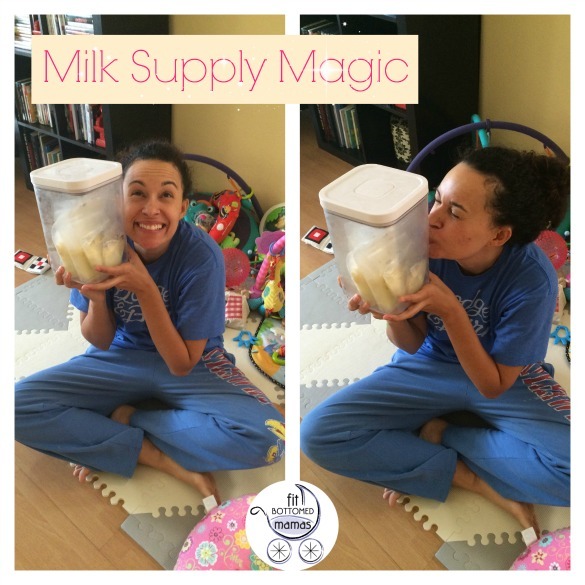 If you too have found pumping and/or nursing to be challenging this may be just the miracle milk maker for you. Try the products and let me know how they worked for you. We’re in it to win it, mamas! I am a firm believer in the magic of Mrs Patel’s. I struggled with my supply too and I found Mrs. Patel’s when doing a late night nursing Google search. I placed an order the next morning of bars and the chai tea. Both of them are delicious and they have become a part of my morning routine. I am now pumping to build a supply, as I go back to work in a week, and I’m feeling confident that I will be able to work and pump without supplementing. What kind of bars did you order? I went to their site but I see they offer several different kinds. I need so much help with my supply… I only pump roughly 1/2 oz-1oz each time. So, I have to supplement with formula for my little 2 month old. I hate giving him formula and would absolutely love if I could produce enough so I could exclusively pump or breast feed. Please help! Thanks! Just ordered mine! Can’t wait to try them! I started using this brand too. I went from pumping 1 oz after nursing to 4. I started seeing results after 2 days. Blanca-are you going to mrsmilk.com? There is only one type of milk bar with 3 different flavors. You can also get it in gluten and diary free. I just ordered the combo pack so I see which flavor I like the best. I just ordered my first supply!! Can’t wait to try it out! Do you need to put all of them in the freezer when they arrive and then take as you need or keep them out and freeze 30 mins before you eat each one. Here goes nothing!! I am 37 weeks with my second and could not produce enough fat in my milk with my first, so I only was able to breast feed for a month. But I also had no idea of all the different ways to help produce more! Interested to see how these bars do for me!! Did anyone experience any fussiness with their baby after taking these bars? When I took fenugreek it made my baby super fussy and sleepless and when I stopped she immediately got better. Just curious! Milk until we came home then my supply dropped so low. I’ve tried fenegreek pills, mix in powders, Brewers yeast, making my own lactation cookies, everything! I usually only get 2 ounces of milk each time I pump. So I’ve had to supplement with formula. I’m hoping these will be my answer for keeping more of my milk in my son’s diet! @tiffany I freeze when I first get them then transfer to the fridge : ) I don’t eat them frozen. My husband sent me the link to this today and I immediately placed an order. I can’t wait until the get here! I’ve been struggling with production for the three months since my daughter was born. I can pump all day and get a combined 2 oz. I’m praying that this works!! First off, thank you so much for sharing!! I just quickly wanted to share..I recently gave birth to my third and as was the case with my last 2 i was having major issues with my supply and had to supplement.. My mom said she once heard barley was good to increase milk supply, i tried it and have been exclusively breastfeeding since!! I am excited to order some of these bars, it can’t hurt right?! ???? I was so excited upon reading this… Until I realized the bars had coconut in them. I despise the taste and texture of coconut. Do you know if they have an option without. How long did it take others to notice a difference? I took my 3rd bar today and still haven’t had much of an increase. I’m hoping it will start to work soon because I he having to supplement with formula! I ordered the bars but I have a question. Do I have to keep ordering or is this a 12 bar thing and then you are good? I believe you keep ordering! I want to thank you for posting this. For some reason, my late night Google searches never led me to Mrs. Patels. But your blog post popped up in my pinterest feed a couple of weeks ago. I’m on my 5th baby and have always struggled with my supply. Despite exclusively BFing #5, I was losing my milk for no reason, right at 2 months. So I ordered the bars and tea. It helped right away. I don’t make tons extra but I make enough to feed her and freeze a little. I have literally tried nearly every other supplement and Rx out there and nothing helped until these. I can’t thank you enough. Super fantastic!!! I especially love the part where you left out the name and link to buy them (sarcasm***). I thought THIS could help me, but all I know is you bought wonder bars from a picture on instagram- I don’t have instagram. It’s linked right where the name is included. Mrs. Patel’s. When can you order them…. I’d really like to try the bars out. How do you get the 20% discount? Due to excessive bleeding after c-section, I was admitted to the hospital for a whole week without nursing my baby and when I came back home, my supply was nearly diminished. I was badly wanting to bf my LO and tried bunch of remedies to establish my supply but I was unable to produce except a few drops. Then started drinking Healthy nursing tea and fortunately, within a few days, I started producing 4 to 5 oz milk in each session. Read this blog and tried the Mrs. Patel’s bars for 12 days. I noticed a slight increase but pretty nominal and not worth the cost of the bars. (I went from pumping for 30 minutes and getting 2 oz. to getting 2.25 inconsistently) very disappointed I was hoping this would increase my supply so i could get more milk stored up for when i go back to work. I just placed my very first order I am hoping my milk supply will increase very soon as I will be returning work very soon. When will you noticed the increase of your milk supply also how often do you have to pump? I am very new to breastfeeding/pumping. With my first child I did not breastfeeding her because she would not latch on but this one was way different and latched on right away with no problems at all and I could use all the help I can get. Please help, Thank you! I just ordered my first box of mrs. Patels and I’m praying these truly are miracle workers. If not I won’t be able to continue to pump or nurse. How soon did you see results after eating the first bar? I’m with the other person who said they didn’t see any real increase. And I bought 2 boxes, most of which are still in my fridge. In all fairness, i did try them while I was on my period (9 month old baby here) so idk if that makes a difference. Maybe I’ll try them again. Hope they work well for others! How many days into eating the bars did it take for you to see an increase in your supply? @Danika You may want to check out the page that lists each product. They list the ingredients for each. @Gabrielle It looks as though Mrs. Patel is no longer offering the discount. (It used to be listed on the checkout page.) I’ve asked the Fit Bottomed Mamas if they can update the post. @Juliet it’s a bummer of an answer but the bars kick in differently for everyone. For me I noticed a crazy hike after the first bar. (Now mind you I still was making sure to eat full and balanced meals…drinking lots of water, etc.) so adding that jump started my supply. I actually ate the bars religiously for three months because I was scared my supply would drop again. Hi! I ordered these milk bars based off your experience and I was so happy when I finally received them. I was able to stomach the taste and I ate them for two days. OMG! My milk supply depleted! I was devastated! I then had to go into super pumping mode and drink lots of water to bring my supply back up! I’m glad you had a better experience than I! I have tried the Let there be milk! I loved that one! I may go back to it! I ordered them before.. But don’t care for the tweeter.. Any tips on what I can do since I don’t care for the taste?? Err… I meant to say I don’t care for the taste.. Not the tweeter. Sorry. So I’m looking into giving these a try because I am an exclusive pumper. My question is, do you just eat the one box and you’re done (unless your supply drops again) or do you have to keep eating them? I know $24 for 12 bars isn’t bad for a one time purchase but for long term that will get expensive. You milk production is basically supply and demand. The more milk you demand from it the more it will produce. It will take some time so don’t loose hope. Something else I have found absolutely fabulous for increasing supply is healthy nursing tea. How long did you wait before you pumped? Did your supply stay up or did you have to keep eating these? Which bar did you buy??? Oh my gosh I’m so glad this post popped up on my Pinterest board. I am in the exact boat you described, tried everything and nothing has really helped. I have to go back to work and to not stress about how my baby is going to be eating is nearly impossible. Thank you for sharing this and I can’t wait to get my bars in the mail and see if they help me. Here’s to more milk!! Which bar did you buy? One of my friends told me about the bars and I too think they are Godsend!And my 3 month old doesn’t seem to be fussy or gassy from the fenugreek so that’s a plus! When do you start eating the bars? I’m pregnant now and would like to be prepared when I give birth. Thanks. I’m going to give it a go! Thanks for sharing. Xiomy A.